Lose the flimsy plastic mounts and GO BIG. 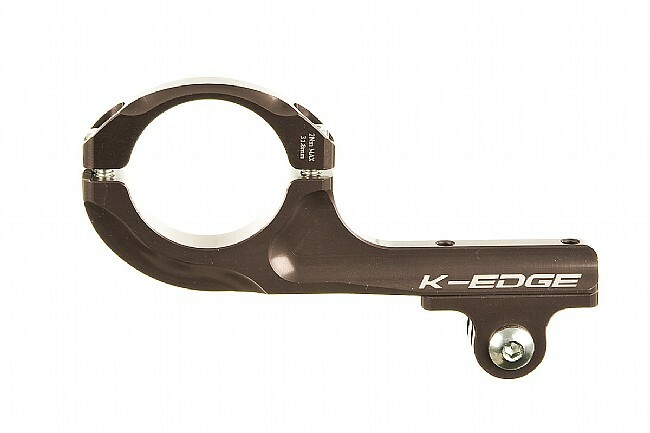 Unlike ordinary mounts, the K-Edge GO BIG Basic Handlebar Mount is made from CNC machine 6061 aluminum, giving it incredible strength, precise attachment, and, of course, extraordinarily low weight. It uses a simple two-bolt clamp system to attach to the oversized 31.8mm portion of you handlebar near the stem. It means no more vibration showing up in your videos, no more stopping to adjust or retrieve a fallen camera, and no more lost memories. This mount places the camera securely in front of or below your handlebar. If you'd like to mount your camera on top of your handlebar, check out the K-Edge GO BIG Basic Handlebar Mount. Available in Black or Red. 46 grams. For 31.8mm bars only. All mounting hardware included. Compatible with GoPro HERO, HERO2, and HERO3 cameras. Made in the USA. K-Edge products come with a lifetime guarantee—if it breaks, K-Edge will replace it.